Climate change at the global scale has emphasized the need for identifying plants with stable productivity under unfavorable abiotic conditions. 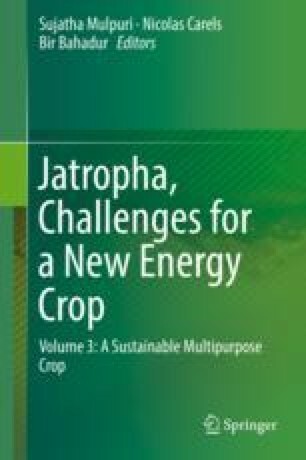 Jatropha curcas is a fast-growing species that thrives with minimum inputs, demonstrates drought tolerance, and has gained worldwide attention as an oilseed suitable for alternative fuel. However, there is limited knowledge on its phenological and physiological behavior under different geographical realms, which imperatively need to be understood before any selective breeding for growth and productivity can be initiated in a particular geographical region. In this chapter, we present a comprehensive information with systematical experimentation on growth and photosynthetic physiology of J. curcas with particular emphasis on elevated CO2 concentration in semiarid conditions. Furthermore, the morphophysiological status is elaborated in the context of photosynthetic efficiency, source-sink interaction, and reproductive phenology in Jatropha grown under CO2-enriched atmosphere.